The Tyler Industrial/Business Park is a 200-acre park located on west Loop 323. Though the park has been traditionally marketed to industrial and commerical business, some of the sites are only conducive for retail development due to the site's size and location. 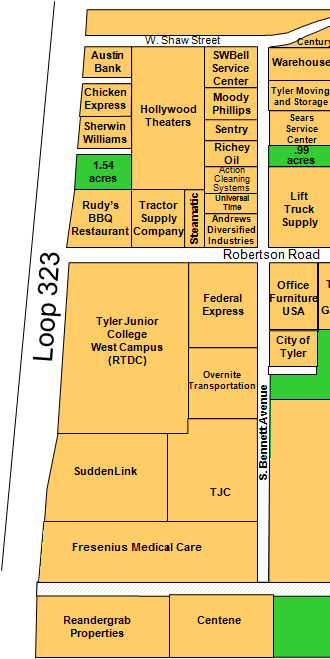 Only one retail pad site remains due to several recent purchases from Sherwin Williams, Chicken Express, Austin Bank, Rudy's BBQ, Tractor Supply Company, and Fresenius Medical Care. The site is located in front of Hollywood Theaters, and the latest traffic counts indicate a volume of approximately 31,000 cars per day along West Loop 323, which marks the western boundary of the site. The site is flat and ready for development. All utilities are available on the site. Site can be accessed directly from a shared access easement off Loop 323 or through a back entrance.